Intimate wear refers to the undergarments for men and women. Generally, visually appealing undergarments for women are termed as Lingerie. Change in women’s perspective of intimate wear from a basic need to aspiration has changed the outlook of this market. Moreover, the category is a barometer of consumer buying pattern during recession because it is a commodity business of necessities, such as legwear, socks, and most recently dual-purpose active wear. The global intimate wear market is estimated to grow at a notable pace, with a CAGR of 8.1% from 2018 to 2025. In response to increase in demand for intimate wear, market players are taking efforts to design intimate wear that satisfy quality, performance, and comfort needs of consumer. When it is about the men’s lingerie, it was overlooked; however, now efforts are being taken to design a variety of lingerie that embrace masculinity. 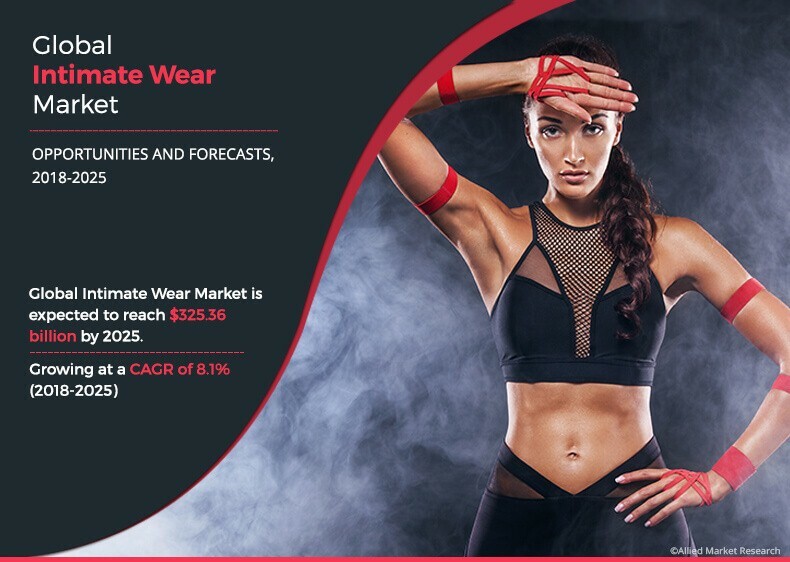 Changes in lifestyle and demographic dividend, rise in awareness on hygiene, and customization of product portfolios boost the intimate wear market. However, prevalence of health conditions in shape wear users is anticipated to limit the market growth. The fabric used to manufacture intimate wear is also enhanced and made more comfortable, thus offering promising opportunities for the market players. The global intimate wear market is segmented based on gender, age group, price, distribution channel, and region. By gender, the market caters to men and women. Based on age groups, it is segmented into 13&dash;17 years, 18&dash;35 years, and 36 years & above. Based on price, it includes luxury, super-premium, premium, medium, economy, and low-priced apparels. Intimate apparels are sold through different distribution channels such as mass merchandizers, mono brand stores, specialized stores, and others. The market is analyzed across North America (U.S., Canada, and Mexico), Europe (Germany, France, Italy, UK, Russia, and rest of Europe), Asia-Pacific (China, Japan, India, and rest of Asia-Pacific), and LAMEA (Latin America, Middle East, and Africa). The global intimate wear market is segmented based on gender, age group, price, distribution channel, and region. Intimate wear is designed for women as well as men. Women dominated the intimate wear market in 2017, accounting for around 59% of the overall market revenue owing to women’s aspiration to stay in line with fashion trends and habit of spending more on intimate wear as compared to men. Intimate wear for men is expected to be a faster growing segment during the forecast period. Age groups consisting of buyers from different ages such as 13&dash;17 years, 18&dash;35 years, and 36 years & above. In 2017, men and women of the age 36 years & above generated more than half of the overall market revenue, owing to the large population base of this group coupled with their relatively higher spending capacity. Intimate apparel is sold through different channels such as mass merchandizers, mono brand stores, specialized stores, and others. In 2017, across all regions, mass merchandizers segment comprising hypermarket and supermarkets, accounted for around half of the overall sale of intimate wear and is projected to lead the market during the forecast period. The others segment, which includes street stores, variety stores, and online channel is anticipated to be the fastest growing channel, with an estimated CAGR of 9.4%. Rise in internet penetration, tech-savvy consumers, and growth in ecommerce market are the factors that drive the growth of the market. Asia-Pacific emerged as a most potential market for intimate apparel owing to skilled labor, strong infrastructure, and low manufacturing cost. China is the major exporter of lingerie to North America and Europe. Increase in national per capita income has propelled the intimate wear sale in China. Moreover, the younger generation is investing significant amount of time and money on their undergarments, which has direct impact on the market growth. Change in consumer perceptions and a comparatively under penetrated market make women’s lingerie a great opportunity for international brands in China. This report provides a quantitative analysis of the current trends, estimations, and dynamics of the global intimate wear market size for the period of 2018-2025 to identify the prevailing market opportunities. The key countries in all the majors regions have been mapped based on their market shares. Porter’s five forces analysis highlights the potency of buyers and suppliers to enable stakeholders to make profit-oriented business decisions and strengthen their supplier buyer network. An in-depth analysis of the global intimate wear market helps determine the prevailing market opportunities. Women are extremely conscious about their outfits. They are progressively inclined toward visually appealing intimate apparel. Thus, several players offer innovative intimate apparel of different varieties, colors, and designs to cater to the requirements. For instance, bridal intimate apparel products are gaining prominence among consumers in the women’s intimates market. In addition, increase in customization of various undergarments in terms of designs, fabric, and other attributes has enforced vendors to focus on the development of innovative intimate wears that fulfill the varied requirements of different occasions. Apart from this, as the intimate apparel products targeted at male consumers are limited in terms of different fit and raw material technology, manufacturers of intimate wear market are now focusing to address the requirements of men as well. This is expected to provide lucrative opportunities for the growth of the intimate wear market in the upcoming years. Distribution channel plays crucial role for the growth of global intimate wear market. Intimate apparel is sold through different channels such as mass merchandizers, mono brand stores, specialized stores, and others. Mass merchandizers comprises of hypermarket and supermarkets and offers a wide variety of intimate wears at low cost to attract customers. This is not possible in case of mono brand stores or specialized stores. Furthermore, digital reach leads to increase in online sale of intimate apparels. For instance, online retailers such as Zivame, plan to open 100 feet stores across major cities to offer customer personalized shopping experience and order best suited products online. Franchise is another big opportunity in this field for well-known brands. Several brands, such as Lovable, have strong franchising network and have maintained their position in the industry. Market players are taking efforts to overcome this limiting factor by introducing skin-friendly fabrics.